This is another pastoral scene of the mountains and valleys of central Costa Rica. I took this photo between Monteverde and Arenal. You can see why Monteverde is known for its cheese, as this is excellent territory for dairy cows. If you didn't know that this was from Costa Rica, I bet you would not look at this photo and think it was taken in Central America. As I have mentioned in my posts a long time ago, Monteverde was settled by American Quakers who fled the USA in the late 1940's because they feared that they were going to be drafted for the Korean War, which was against their religion. They were attracted to Costa Rica because Costa Rica abolished its military. 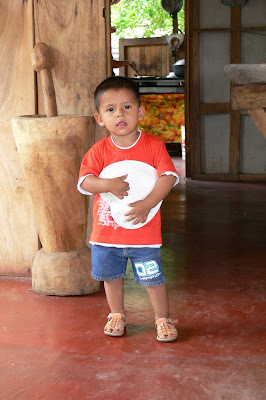 They settled in Monteverde and went into the business of making cheese, which is sold throughout Costa Rica. Cheese was good product because it could be transported over the mountainous terrain. When they first started the business, they used for cheese molds the round cardboard Quaker Oats containers. This week we are showing photos of Ek Balam, a unique but lesser-known Mayan site in the Yucatan Peninsula of Mexico, on our Viva la Voyage site. Much of Costa Rica is mountainous. A spine of mountains runs the length of this narrow country, dividing the Caribbean and Pacific sides of the country. This is a photo that shows typical terrain of the mountains and valleys that form the central part of Costa Rica. Although in Costa Rica you are never far from the ocean -- in fact, never far from two oceans -- elevations reach as high as 3,820 meters (12,532 ft.). The mountains that run the length of the country make road construction difficult. For those of us on the Pacific Coast, such as Tamarindo, we are grateful for the mountains because they keep any hurricanes over on the Caribbean side, as the hurricanes cannot cross the high mountains. The higher elevations of the central highlands makes for pleasant temperatures all year around. As you can see from the green mountains and valleys, this area gets abundant rainfall. The combination of mountains, valleys and adequate rainfall also combines to provide terrain suitable for dams and hydroelectric power. Costa Rica gets almost all of its electricity from dams. This helps make possible Costa Rica's goal of being the world's first carbon neutral nation by 2021. We are showing photos of Ek Balam, a unique but lesser-known Mayan site in the Yucatan Peninsula of Mexico, on our Viva la Voyage site. I like this hummingbird photo because the camera was fast enough and the hummer's wings were slowing down to land, so that the wings were partially captured in the photo. I have mentioned the exceptionally high metabolism of hummingbirds, their lack of storage capacity for calories, and their very frequent feeding. That raises a question. What do they do at night? How do they store enough calories to keep their little hearts beating so fast? The answer is that at night they lower their body temperatures as much as 17 to 28 degrees C. (30 to 50 degrees F.) and go into a very deep sleep to conserve energy. Like bears in the winter up north, in essence they hibernate each night! Hummingbird feathers were of special importance to the Aztecs, who used them in wedding ornaments. 25 species of hummingbirds are considered threatened. One of those, the mangrove hummingbird, is found only in the mangrove forest patches of Costa Rica's Pacific coast, such as the Tamarindo and Langosta estuaries that I have shown on the past on this website. It is critical to protect such habitats. This week we are showing nighttime photos of Budapest on Viva la Voyage. Budapest is beautiful at night, even if it does not have any hibernating hummingbirds. Hummingbirds are classified according to their color, and their colors are often irridescent. They are native to the Americas. I wonder if they have spread to Europe, Asia, Africa or Australia. I selected this photo because it is unusual to see the back of a hummingbird. In flight, the usual view of a hummingbird is a profile, not his back, because by the time you could see his back, he would be gone. Hummingbird's are naturally curious, and they will dart around people to check them out, then dart off when their curiosity is satisfied. They can hover in place and can even fly backwards, which makes them unique. This appears to be a female green-crowned brilliant hummingbird, known locally as brillante frentiverde, and its scientific name is heliodox jacula. This week we are showing nighttime photos of Budapest on Viva la Voyage. Today is the Thanksgiving holiday in the USA, where most of the readers of this blog are located. Rather than showing a large turkey, I am showing tiny hummingbirds this week. Hummingbirds need to feed often because of their high metabolism. They move fast, their hearts beat 10 times faster than ours, and they store so few calories that they weigh about the same as a large paper clip. These two birds are likely not a pair. Male hummingbirds mate with females, but otherwise are not involved with the females, who nest and raise the children alone. Hummingbirds can be territorial and scare off other birds, including other hummingbirds, from the flowers they frequent. In this shot the birds are sharing the feeder nicely, and evidently must share the nectar with a bee. Costa Rica has more than 50 species of hummingbirds. They must eat several times per day to support their hyper-active metabolism, which includes a heart rate that beats 600 - 1,000 times per minute. They get all of their food through nectar from flowers or, such as this photo, from a hummingbird feeder. Hummingbirds are difficult to photograph because they move so quickly. The feeder makes it easier, as it provides a spot on which to focus and provides a place where you know hummingbirds will come. Photographing a hummingbird in flight in a garden or forest is extraordinarily difficult for me. Most restaurants in Costa Rica are open air, like the restaurant that I showed yesterday. In one restaurant that we went to in Monteverde, a small injured bird was found and was being nursed back to health by the workers in the restaurant. Here is the bird, sitting in a milk carton that the restaurant staff used to hold the bird. This looks like a female golden-browed chlorophonia, which is a member of the tanager family. A male golden-browed chlorophonia differs from because it has a yellow streak on his forehead and over his eye, and his coloration is a little brighter. Tanagers are native to the Western Hemisphere. There are 230 different species of tanagers. They will flock with other birds and will inhabit areas close to man. They particularly like fruit trees. Costa Rica is home to more species of birds than the USA and Canada combined, so I feel fortunate when I can find a bird with which I was not familiar in a guidebook in order to share the information for this website. I confess that I was not familiar with the name of golden-browed chlorophonias until I looked up this bird photo. This is the beach at the Barcelo Langosta Resort, which I showed yesterday. The Pacific Ocean is to the right, and the mouth of the Langosta Estuary is in the center of this photo. Across the mouth of the estuary you can walk for miles along Langosta Beach. This beach is very popular with surfers. One person who stayed in our Langosta Beach condo described it as "epic surfing." Our condo is about 50 meters behind the spot where this photo was taken. We do not surf, but we love to go for walks along the beach. If someone wants to "saddle up to the bar," what better way than to sit on a real saddle and to look out at a forest while listening to the rushing water of a river? This is a roadside cafe on the way from San Jose to Monteverde. It was the morning when we stopped by, so it was too early for customers to be lounging on the patio and the outdoor bar overlooking a river and forest. This struck me as a unique setting for a restaurant, but if there every was a place where a bar with saddle seats positioned to overlook a river and forest seems in place, Costa Rica would be it. Pinuelas plants are relatives of the pineapple, as is apparent from this photo of the fruit. The fruit is edible, but it is sour. They grown in the wild, and are planted in places as a natural barrier. The leaves are thick, sharp blades more than one meter long, with thorns on the edges of the leaves. 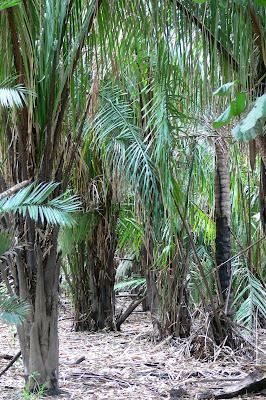 No one could walk through a thicket of pinuelas plants, as they would slice up your legs and tear your clothes. Our condo on the beach in Playa Langosta has a barrier of pinuelas plants on the back of the building to separate the building from the beach. The dense thicket of spikes and leaves keeps people from the beach from wandering up to the pool area, as we certainly would not want strangers in the pool. The plants are a little less than one meter (3 ft.) tall, allowing views of the ocean over the plants. It is a more attractive barrier than a fence. Today is Sunday, so we have posted new photos on Viva la Voyage. This week we are featuring night-time photos of Budapest, Hungary. Here is yet another heliconia. This variety is a heliconia wagneriana. I mentioned yesterday that some heliconia flowers, such as yesterday's, hang down and some others, such as today's photo, grow upwards. This type of heliconia grows 2 - 4 meters tall (6 - 13 ft.) , and is native to an area from Belize and Guatamala south through Costa Rica to Ecuador. This is a heliconia rostrata, known locally as a platanilla. Some heliconias have flowers that hang down, while others have flowers that grow up. This plant's flowers hang down. Heliconias are widely planted in gardens in Costa Rica. They are popular in part because their flowers bloom all year round. We have heliconias in the gardens around our condos in Tamarindo, although this is another of the photos that I took in the Lankester Botanical Garden near San Jose. Check out photos of Murano, Italy at Viva la Voyage! Here is another flower of the thousands of species of plants growing at the Lenkester Botanical Garden. I am sorry that I do not know the type of flower that is shown in this photo. Perhaps a reader will know and will leave a comment educating me. This is a sample of just a few more of the 800 species of orchids in the Lankester Botanical Garden near San Jose. The garden feature a trail that allows an easy walk through areas that feature bromeliads, heliconias, palms, bamboo, cacti and succulents, and more. For visitors to Costa Rica who begin their trip in San Jose, the gardens are a nice way to get oriented to the different types of plant species in Costa Rica so that visitors will recognize and appreciate the plants that they will see in the wild for the remainder of their trip. By the way, speaking of visitors, I should mention that an article in one of the Costa Rica newspapers recently said that although tourism is down a little bit due to the worldwide recession, it is not down very much in Costa Rica compared with other places. In 2008, there were more than 2 million foreign visitors to Costa Rica, which is very good for a country with a little more than 4 million people. Think about what the visitor traffic would be like in your country if the number of visitors over the course of a year equalled one-half of the number of residents. I have not posted flowers in quite some time, so here is an orchid. 1,500 species of native orchids grow in the wild in Costa Rica, and you can see them on hikes in the forest. The easiest way to admire orchids, of course, is in gardens where varieties are displayed in plain view, without having to go on a hike in the forest for an occasional specimen. I took this photo in Lankester Botanical Gardens near San Jose. It cultivates more than 800 varieties of orchids, and more than 3,000 different plant species. Lankester Gardens was founded in 1973 to carry on the work of a British amateur orchidologist, Charles Lankester, who planted an extensive garden of orchids and epiphytes on his farm. When he passed away, the American Orchid Society and the Stanley Smith Horticultural Trust recognized the importance of preserving his garden and took the lead in donating the 11-hectares (28 acres) garden to the University of Costa Rica, which maintains it for public visits. This is a closer view of the same sunset as yesterday. As the sun descends closer to the ocean, the marine layer of clouds start to give a marble texture to the color of the sun. It has been quite a while since I showed a sunset photo. Here is another sunset over the Pacific Ocean shown from the balcony of our condo on the beach in the Playa Langosta area of Tamarindo. Today is Sunday, so we have again posted new photos on our Viva la Voyage travel photo site. This week, we are following up last week's photos from Venice by showing photos from Murano, Italy, one of the islands in the Venetian lagoon, famous for its centuries-old tradition of glass blowing. Here is a closer photo of yesterday's dog. The enthusiasm and joy of the dog is evident in the splash of the water as the dog runs back to shore to return the stick to his master. I have a soft spot for Yellow Labrador retrievers, as this dog appears to be. While my two boys were growing up we had a Yellow Lab named Tortilla, as she was the color of a flour tortilla.. Some dogs have trained their masters quite well to throw sticks for the dogs to retrieve. What better place to play and retrieve sticks than the beach? If either the dog or master get hot, there is the refreshing Pacific Ocean to splash around in to cool off. I don't know who was having more fun, the dog or his master. This appears to be a father and son paying ball on Tamarindo beach. They were having as much fun as the dogs playing in the surf behind them. The beach appeared to be a good place to kick the ball around. The beach was like an automatic ball return. If they kicked it to the right, the slope of the beach would bring the ball back down. If they kicked the ball too far to the left, the waves would bring the ball back up. And if they got hot and sweaty playing ball, well, there's the refreshing Pacific Ocean for a dip to cool down. An instant after the photo I showed yesterday this surfer struck this pose. His clenched fist pump looks to be a gesture similar to Tiger Woods when Tiger sinks a long or crucial putt. I will certainly not diminish his sense of satisfaction with his surfing accomplishments. It looks to me like he has reason to celebrate. This surfer is riding the crest of a wave. He is extending his arms either to help his balance or to draw attention to his exciting form and adventuresome approach to surfing. Tomorrow I will show you what happened to him next. Do you think he fell down and wiped out, or do you think he continued to ride this wave, surfing with a flourish? This is a view down the main part of Tamarindo beach. I have been showing a lot of wildlife photos recently, so now it is time to spend some time at the beach in my upcoming photos. Sometimes people who are inquiring about renting one of our condos will ask the beach is crowded. Here is the answer. There is plenty of room on the beach, even in the main part of town. Although Tamarindo is a popular beach resort, in Costa Rica there are so many beaches and not very many people. Even during the peak time of the year, which is the Christmas and New Year's holiday season, there is plenty of room to set up a spot to enjoy the beach and to swim without being bothered by other people too close. It is nothing like the crowds that you see on beaches in the USA. Today is Sunday, and for many people that is a day of rest. What better place to rest than on a hammock, in the shade, next to the ocean. I took this photo on the grounds of the Capitan Suizo hotel. The southern end of Tamarindo beach and bay are in the background, with San Francisco point in the distance. Langosta beach is around the corner to the left. Today is Sunday, so we have posted new photos on our Viva la Voyage travel photo site. This week, we are taking you to one of our favorite cities -- Venice, Italy. I have posted leaf cutter ants previously out in the forest, but these attracted my attention for several reasons. They were carrying bright red leaves rather than the typical green leaves. This trail of leaf cutter ants was not in the forest, but was in a parking lot in Playa Langosta. It appears to me to be a challenge for tiny ants to carry leaves much larger than they are, but the gravel added to the challenge, in comparison to walking across the smooth forest floor. In fact, in this photo it appears that there are two ants and one of them has taken a tumble off the higher gravel stone and is on his back struggling with the leaf as the ant right behind him has walked up to the scene of the accident. We had lunch in a little village after our wildlife boat trip in Palo Verde National Park. The grandchild of the family that operated the boat tour and a village restaurant was on hand and curious about our lunch. He looks like he is ready to help set the table. The best way to do a wildlife boat cruise in Palo Verde National Park is to make arrangements with a tour operator in Tamarindo and to have them take you. They will make arrangements with a boat operator and a little family run place in a village afterwards for lunch. The road to the boat landings in Palo Verde National Park is a country road that has many turnoffs as it goes past farms, villages and through the woods and jungle. It would be virtually impossible to find the boat landings in the river without a local guide. The coatis that I showed yesterday quickly disappeared into this jungle. A group of about 15 - 20 coatis darted across the road and within a couple of seconds they were gone. We walked in a little ways to look for them, but without any luck. As you can see, there are lots of places for an animal to hide in the jungle. We then returned to the comfort of our car and decided it was time for lunch. I am sorry I could not get more and better photos of them. I did get some photos as they scurried across the road, but the photos were too blurry to show on this website, as the coatis were moving quickly. I will try to be more prepared and do better next time. This is a larger view of the same photo that I showed yesterday. Yesterday I showed a cropped version of just the baby on the rock in the center. He was the focus of my photo. But look above him and to the left. It will help if you enlarge the photo. You can see part of his much larger mother. The mother's head is patially hidden behind the tree, but she is looking back at me and her baby. There is also an animal darting away at the left edge of the photo. We saw about 15 coatis running across the road in front of our vehicle, so I stopped and hopped out to try to get their picture. They were scurrying about and quickly disappearing into the jungle. I did not have enough time to frame my photos well, and in my haste to get a photo of the baby coati, I did not even see the mother. I apologize for not getting a good photo of his mother. How do I know that the large coati nearby was the baby's mother and not the father? Coatis are raised by their mothers, without participation of their fathers. They are born in nests in trees in litters of 1 to 5. Female coatis travel in groups. Coatis are 45 - 70 cm long (18 - 27 in. ), plus a long bushy tail that they usually hold upright when they walk. The term coatimundi is sometimes incorrectly used. It is not a synonym for coati. Coati is an indigenous word for the species. Coatimundi was the indigenous term to refer to a male coati traveling alone. This baby white nosed coati was part of a group of about 15 coatis that ran across the road near our vehicle as we drove from Palo Verde National Park back to Tamarindo. Although coatis are classified as carnivores, like many Costa Rican carnivores, they actually prefer fruit to meat. Coatis are part of the family of mammals knows as procyonidae. There are three species commonly seen in Costa Rica, white nosed coatis, kinkajous, and northern raccoons, which I have shown in the past on this website. The white nosed coati's scientific name is nasua narica. In Spanish they are called pizote. Costa Rica is unusual because it is one of the few areas of the Western Hemisphere where the mammal species living in the area today are the same as when Europeans first arrived. Tropical mammals differ from mammals in temperate climates because they do not hibernate. It is too warm and they would expend far more energy sleeping than a mammal's body could store. Also, their predators and bothersome insects are active all year, unlike in colder climates. The crocodiles that I have shown on this website have generally been rather still. I therefore decided today to show a crocodile in motion. I realize that you can't see very much of him, as he has kicked up a splash that has obscured the view of him as he lunged and spun in the water. A portion of his back is visible to the side of the splash. I stayed safely in the boat. I once leaned over the edge of the boat so I could get an angle shooting up at a crocodile on the river bank and he darted into the water so close that he spattered me with mud. He surprised me with how fast he moved. The splash of the water in this photo gives an indication of the speed and force of crocodiles when the move in the water. Today's Monthly Daily Photo Theme Day theme is doorways. This is the front doorway of our condo building on the beach in Playa Langosta. The tree that you see through the doorway is actually on the beach. What is missing from this doorway? How about the door? 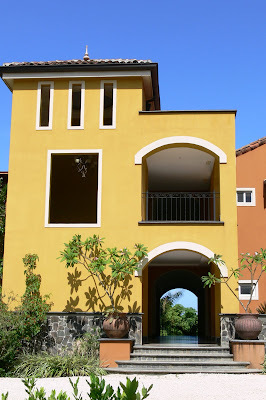 Like many buildings in Costa Rica, there is no door and the entranceway and corridors are open to the weather because the weather is always warm. Most hotels and restaurants in Tamarindo do not have doors or walls. Our condo is directly through this doorway towards the ocean, on the left side of the central corridor. Yes, we do have a front door to our condo unit. The condo building has a distinctive mustard and pumpkin color. A friend of ours, Tim Keneipp, liked the colors and view of the end of this corridor, with ocean and trees framed by the archway and he gave us a painting that he painted of the scene. Tim is a talented architect and artist whose works can be seen on this link to LeafDogArt.com. Today is Sunday, so we have posted more photos on our Viva la Voyage travel photo site This week, we are sharing some photos of one of the world's most remarkable, modern buildings -- the Sydney Opera House.